Blurring the lines between costume and fine jewellery, ManiaMania is an accessories label experimenting with the mystic past to create a magical future. 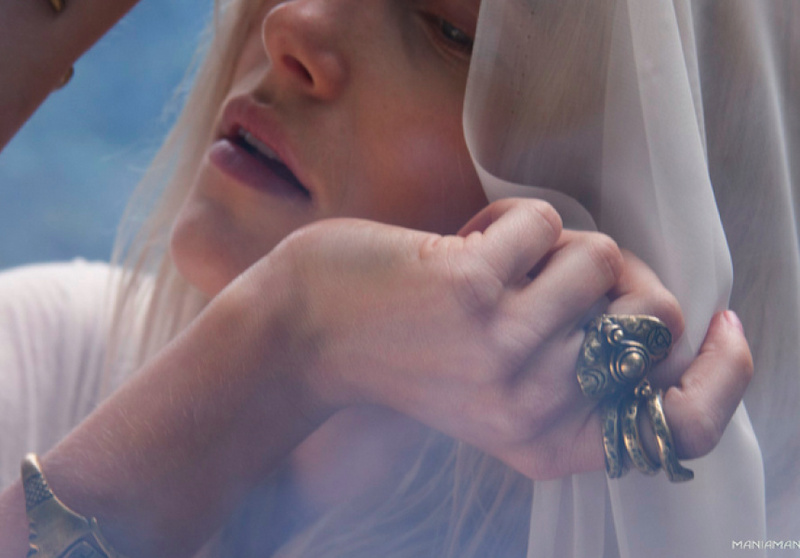 Chunky gems, mystic crystals, zodiac engravings and dusty brass – it might sound like the kind of clichéd kitsch you would find in an incense-drowned hippie store, but jewellery label ManiaMania’s latest collection belies its very materials. Since debuting in 2009, the Sydney-based label has struck gold within its uncanny costume-meets-fine jewellery niche, refining vintage icons and presenting them in a fresh new light. It's a somewhat complicated formula made effortless, managing to walk a fine line between tragic and magic. Like they say, nothing good ever comes easy. Behind this modern mystical aesthetic are ex-Russh magazine creatives Tamila Purvis and Melanie Kamsler. During their pioneering days at the now iconic publication – where Purvis worked as fashion editor and Kamsler art director – the pair connected via their shared sense of style. "We were always into similar references and loved the story telling aspect of fashion and editorial," says Purvis. "Our references were almost always music and films from the 60s and 70s and when this evolved specifically into jewellery from that time, we decided to start making it." For their first foray into design, the duo were given the impressive deadline of the Zimmerman show at Australian Fashion Week. With Purvis working as Zimmerman's stylist, the collaboration came somewhat naturally, although Purvis concedes that the two labels do have their differences. "Zimmermann's aesthetic is a lot more modern and less bohemian, so it’s fun to have another avenue to create." Despite the challenges, the collaboration was a success, so much so that ManiaMania accompanied Zimmerman on the catwalk again this year at MBFWA. While the design process came naturally, the rest was, as Purvis puts it, “a little tricker”. "We've worked in fashion for years, but we only know now, after having our own label, what a huge amount of work it is and how much goes into each piece and the brand, and we don't even make clothes!" The label's designs and campaign images show ManiaMania to be a slick yet spirited force and their popularity – particularly in regards to their highly sort after Abbey Lee ring (named after model muse Abbey Lee Kershaw) – has often been described as “cult-like”. It seems not so much of a surprise then that their latest collection, The Modern Utopian, was inspired by cults of the 60s and 70s. Starting with the discovery of 60s band Ya Ho Wha 13, the duo delved further to find that the group were actually members of hippie cult, The Source Family. "From there we researched the cults and communes that emerged around California in the late 60s. The Modern Utopian was the name of a magazine on communes that was published during the time." ManiaMania have made a name for such esotericism. From surrealist books to an image of Bowie dressed as a sphinx, the label's aesthetic is one of soul, magic and bohemia. Make no mistake though, this isn’t a label to be branded with the cringe-worthy 'boho luxe' tag. They may take inspiration from disparate sources, but Purvis and Kamsler do their research. Whether it be a 70s-style tooled bag or tusk shaped pendant, ManiaMania offer authentic styles with a modern edge. "We are really interested in mysticism, but also the concept of jewellery as an object for personal expression, empowerment, symbolism and nostalgia," says Purvis. What could be more appealing that that?